Upps, I did it again.... Actually, I really liked my first jumpsuit and jumped immediately in another jumpsuit project. I do not have much viscose in my stock, as I do not sew from it much (and there is a good reason for that). However, I bought this full red viscose back with little whte triangles in 2014, I think it comes from the first batch of fabrics, I actually took it because it cost only 3eur/3m telling myself that it would work for muslins. What a crazy idea, but I was young and inexperienced then... Of course, the fabric got never used for muslins and slept in my stock, so I decided to use it for this rather funny project. Coming back to my jumpsuit. 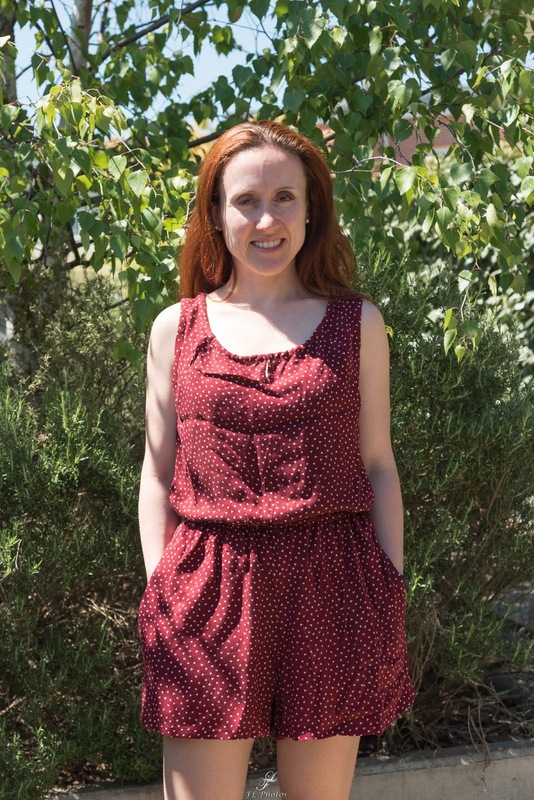 The pattern is 124 from Burda 04/2016, I omitted the waistband and the back zipper and put in an elastic in the middle. I changed the back opening to 2 hooks and eyes instead of the laces - with long hairs it is much less fussy. And of course, I sewed a short version, an pockets - yes I have pockets. Sorry for the overexposed pictures, but it was too nice not to go out for the pics. 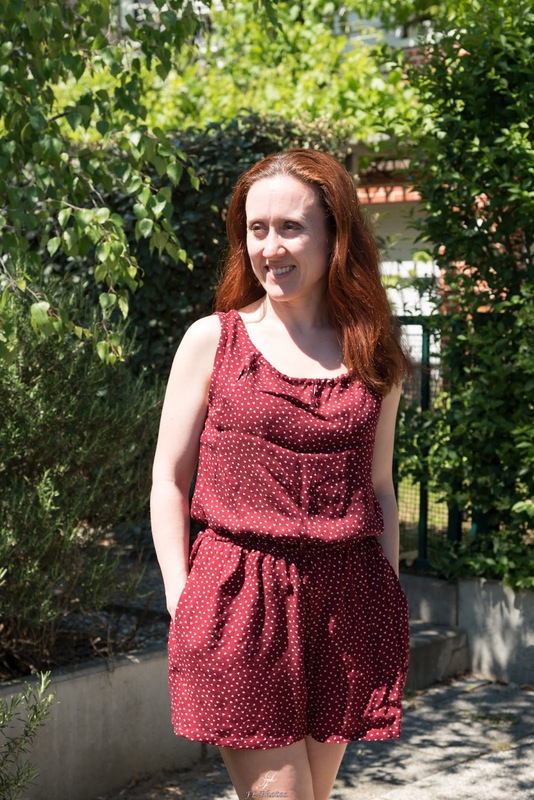 As for my previous jumpsuit, this one is also a success and will make a cute piece for holiday season. 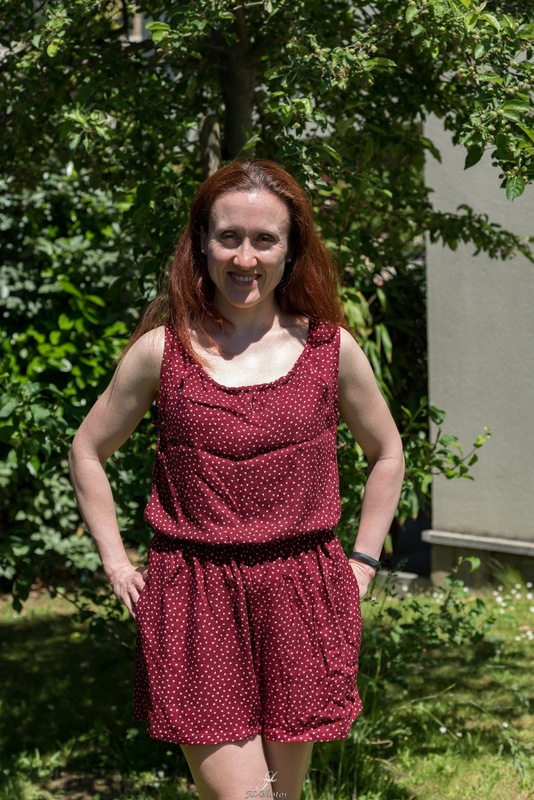 And promised, this is the last jumpsuit of this season, I am starting my dress serie now. Your jumpsuit is fabulous! And I love the elastic waist, it makes a lot of sense! Re viscose - it is a nightmare to work with, but I find it's easier if I stablise it with spray starch first. I peg it to the washing line, and give it a good spray and let it dry. It helps a lot, and then it washes out once the garment is finished. Thank you! I knew the trick for silk, but never imagined using it on viscose, thanks for the tip.